The thing about Melanie DewBerry is that she did not come here to mess around in the shallows. Listen to Reva Patwardhan’s conversation with this shimmery, brilliant, sparkly woman who is a coach, speaker, author and indigenous ceremonialist in this week’s episode of the Dialogue Lab podcast. We went deep, deeeeep, on what it means to act for change from a place of stillness. And how that is an essential journey for anyone who wants to take a stand for social change, while not losing themselves in the fight. Rebecca shared her journey as someone making her way in the nonprofit space, from her early disillusionment in nonprofits, to finding her unique way of making an impact as a coach. We also talked about the double-bind -- that special way that women, people of color, and people with marginalized identities find themselves stuck between a rock and a hard place -- and what to do to navigate your way out of it. Rebecca has such a clear and thoughtful way of speaking about the kinds of things we all struggle with in the nonprofit space, and I look forward to sharing it with you. “One of the things that annoys me about this dynamic, is that women have been socialized since Kindergarten to follow the rules, to do what they’ve been asked to do. Girls outperform boys in school across the nation, they get admitted to college more than the guys do, they finish college at greater rates than their male counterparts, and as soon as you start looking at management, they drop off the scales. Daphne Robinson is an Assistant District Attorney by day, an advocate for criminal justice reform by night. In her 20 years of working within Louisiana’s juvenile justice system, Daphne saw the system failing to protect kids -- kids who were committing crimes, and kids who were victims of crime. She got her masters in public health, and started a nonprofit called, The Center for Public Health and Justice. How a concern for kids caught up in the criminal justice system led an Assistant District Attorney to create evidence-based and community-based alternatives to prosecution and incarceration. A conversation about how nurses can be transforming health care by adopting a coaching, anti-racist, and social justice mindset. New episodes every other Tuesday! Subscribe in iTunes, Stitcher, or Google Play, or your favorite podcatcher. Nikki is out to transform nursing. She’s working to address the ways that racism shows up in medicine, and affects the wellbeing of patients, and practitioners. She also wants to equip nurses with the tools they need to be influential, at the point of care, as well as with policy makers. We started our conversation by talking about her early days as a nurse, when the seeds of her social impact mission were planted. [12:06] what I remember in the very beginning was how difficult it was for me to sort of wrap my head around not only critical care in nursing, but just wrap my head around the culture that I was working in. I worked in a culture in nursing that really allowed and permitted workplace bullying behavior, which we call in nursing, “lateral violence.” ...Anywhere from 40 to 80% of nurses will be a victim of lateral violence…. so I was definitely in that kind of culture. A very high stress, intense workspace. [16:15] People started to come to me and tell me to watch my back. And said, you know you need to watch what you're doing. And it was scary. It was scary in a whole new way for me because then I just didn't know. I didn't know why it was happening. But sadly, what was hardest for me was that being a black woman, a woman of color, what came up for me first, and the lens that I was looking through, was, “is this happening because I'm a black woman?” That was the hardest part for me. And that was the part that I had the least control over. Like I could control my education. I went to the number one nursing school in the country at the time. And I did fine. And I was just really concerned that the reason why I might not make it on this floor would have nothing to do with my skill or my competence. But would have to do with being a black woman. And that's when I started thinking about social justice. And that's when I started thinking about cultural humility. And the role of how nurses give voice to social justice in general, and what we really need to do to help all of us feel included in the work of nursing. [23:19] I was just taken aback that nursing wasn't doing more in nursing schools and curriculum. [Racism] is just not addressed. It is addressed in a very surface way. We’re very comfortable using expressions such as “health equity,” using expressions such as “social justice,” and we've even gotten better about ...the things that are closer to us now like unconscious bias…. However what I have found in general is that people just aren't really ready to use the word “race.” To really say that word out loud. Or “racism.” Afraid to say that word to put a name on it, or class and classism. We're not comfortable using those types of expressions in professional spaces. ...In professional spaces where people's lives actually depend on our ability to not only have these conversations and stop playing small about it, but really depend on our ability to impact people in global ways. What he found was that these everyday [racist] slights actually did show these physical and biological changes in the body. In the inflammatory processes -- in the inflammatory immune system, and inflammatory processes in the cardiovascular system. It put all this additional stress on the body. It actually put people at increased risk for high blood pressure for abdominal obesity, breast cancer, heart disease, and even premature death. And so it begs the question, is health connected to race? And it is. [38:52] Nurses are the largest group of healthcare workers in the United States....Nurses are everywhere. I mean we're in hospitals, we're in schools, we're in prisons, we're in outpatient clinics, we're in community centers, we are ...in rural areas ... We're also the very front line for patient care…. That's why I think I think nurses are going to be the vehicle by which health policy is going to be dynamically changed in the United States. [52:53] [On humility in leadership] This is really tricky because healthcare providers don't want to be perceived as though they don't know something. This is hard work for us because people come to us for answers. They come to us because we have expertise. And we have to do the work ... to learn that, yes, competency comes in understanding the pathophysiology of someone, the biology of someone. But we cannot be competent on someone's emotions, the way that they can. We cannot be competent on what people want out of their lives. We cannot be competent on exactly where that person is coming from. For that, we must accept humility. [1:06:35] I have a basic trust that for the most part humans want to be the best humans that they can be…. And I believe that healthcare providers are no different, because they're just people. And they're put in a position of having to know a whole heck of a lot, without a whole lot of training. And that's what I'm here to really do is to help train people who have not had the ability to learn about working in multicultural spaces. About understanding how to take care of people from different backgrounds and different groups. and understanding power differences. I'm here to expose those things so that people have a greater level of humility. and humility comes from internal work. It comes from the combination from the internal work, and from being exposed to people who are different than you. "...I think about my immigrant parents, who came to the US relatively resource poor. And my mother is the best recycler I knew! She recycled, she re-used, she reduced her use, like the best! I mean she was recycling before recycling was a thing. 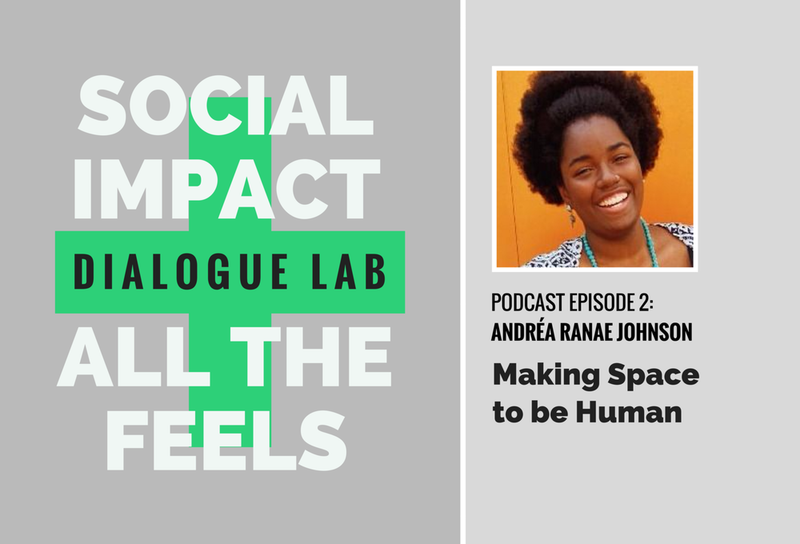 That’s Sujatha Jesudason in the fifth episode of my podcast (Dialogue Lab: Social Impact + All the Feels). Sujatha is the founder and Executive Director of CoreAlign, which is building collaborations to ensure that all people have the resources, rights and respect for their sexual and reproductive lives. She also just started teaching about innovation in social movements at the Milano School of Public Policy at the New School in New York. Listen to our conversation about reproductive justice, speaking race to power, collaboration across difference, and innovation in social movements. "I had to build my own visibility, my own clout as Chandra, in order to make things happen the way I wanted to see them. So not only as a person within an organization.... But also I had to build it for myself, so I had some major influence on what happened in my city…. That’s Chandra Brooks in the fourth episode of my podcast (Dialogue Lab: Social Impact + All the Feels). She is a leader who is experienced in building collective power and creating change in her community, and now she’s working to prepare women of color who are new to politics to run for office. She’s doing this through a project called The SocialPreneur. A conversation between Dialogue Lab's founder Reva Patwardhan and Lee Mun Wah focused on finding the courage and compassion to stand up -- even when courage comes at a price. And on his work to encourage that capacity in others as well. New episodes every other Tuesday! Subscribe in iTunes, Stitcher, or Google Play, or your favorite podcatcher. A conversation between Dialogue Lab's founder Reva Patwardhan and Brigette Iarrusso.. about politics, anger, and love. We talk about her family's experiences since the hurricane in Puerto Rico, being a mom, the lessons she's learned, and her work with social impact leaders.